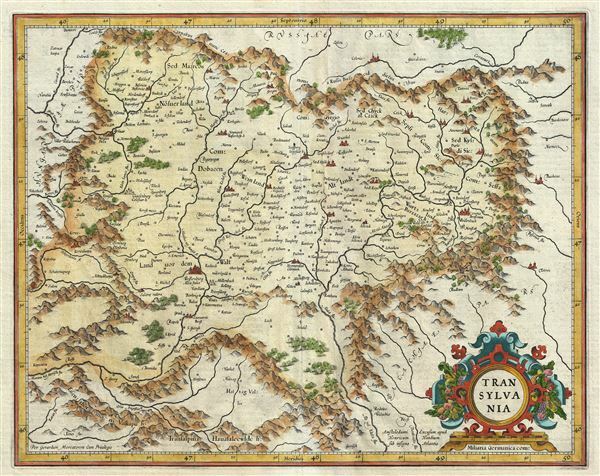 This is a beautiful 1606 map of Transylvania (present day Romania) by Gerard Mercator. It covers what is today the northern part of Romania and from the Kerezbanya east as far as Totros. The map notes several towns, rivers, forests, mountains and a host of additional topographic features. Mountains and forests are beautifully rendered in profile. The map is adorned with a strapwork title cartouche in the lower right quadrant. Verso features French text describing Transylvania (Transilvanie Siebenburgen) and pages 192 and 189. This map was created by Gerard Mercator and included in the 1606 edition of Atlas sive Cosmographicae. Very good. Original platemark visible. Minor wear along original centerfold. French text on verso. Van der Krogt, P. (Atlantes) 7700:1A.1.